Many people ask me what makes technology so successful at ASB. One of the things I think is that for many years there has been a clear division of roles. Each campus as a Director of Educational Technology and each campus has a Director of Technology Support. I spend my time focused on teaching and learning, supporting both teachers and students to make thoughtful decisions about how to use the technology. I never have to worry about networks, cables, budgets, hardware, subscriptions and so on (things that I did sometimes do in previous jobs, but which I never enjoyed). We each have a clear area of focus. 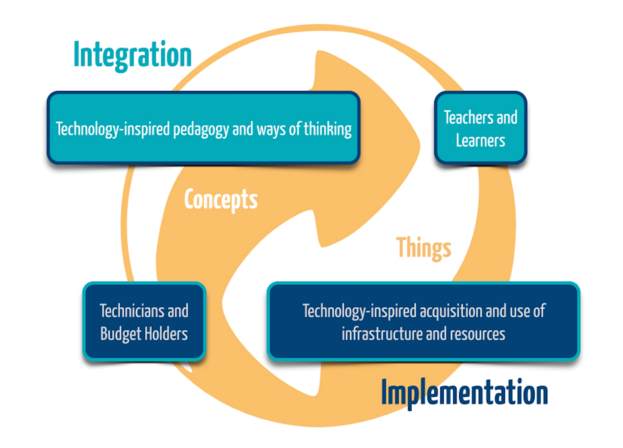 I was really encouraged on reading the new IB document Teaching and Learning with Technology, that this model is one that is promoted. This model, shown in the diagram above, is "the thinking that separates the concepts related to technology from the things we use that are technology. Integration is about pedagogy and it is the focus on what teachers and students are doing. Implementation is the tools and infrastructure that supports the teaching and learning. Without integration, implementation doesn't work. Integration drives implementation, not the other way round. Agency: ways of being - the skills and concepts related to academic honest, digital participation and internet safety that leads to being safe and responsible online. Information: ways of knowing - searching, analyzing and manipulation information and the responsible use of data. What do you think of the new ideas that have been published by the IB? How will your school be using them?